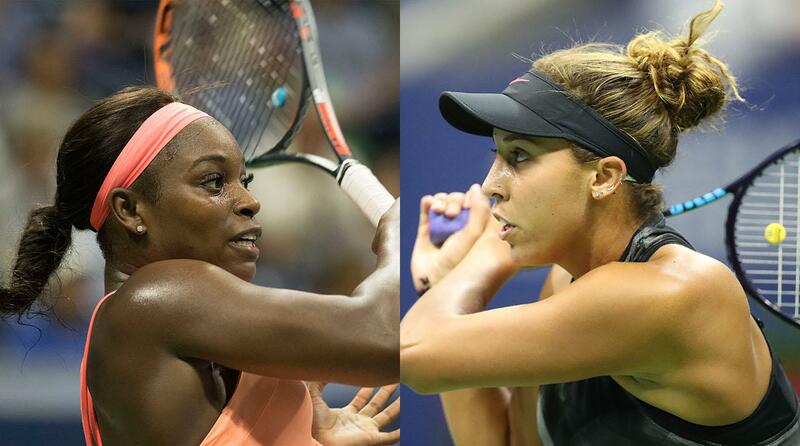 Madison Keys and Sloane Stephens will meet in the first all-American women's final at the US Open in 15 years. The pair, close friends, will make their Grand Slam final debuts on Arthur Ashe Stadium at 21:00 BST on Saturday. Both players returned at Wimbledon after undergoing surgery this year, 15th seed Keys on her wrist and unseeded Stephens to her foot. Serena and Venus Williams were the last Americans to line up against each other in the US Open women's final in 2002. Serena is absent this year after giving birth to her first child, and Venus was beaten by Stephens in the semi-finals. The winner will be the first US woman outside of the Williams final to win a major singles title since Jennifer Capriati at the 2002 Australian Open. Neither of Saturday's finalists were even playing at this year's first Grand Slam in Australia as they were both injured. "I was actually laughing and thinking, who would have thought in Australia that Sloane and I would be the finalists at the US Open?" said Keys. Both women were highly-rated prospects at a young age, each reaching the Australian Open semi-finals at the age of 19, and their careers remained on an upward trajectory until injuries last year. Stephens, 24, was ranked 957th in the world six weeks ago, having spent 11 months out of the game with a foot injury that required surgery. She has returned in spectacular form, taking her recent record to 14 wins in 16 matches when she won a thrilling final set against Williams on Thursday. "I knew that it was going to be tough," said Stephens. "I was in a walking boot like a month before I played Wimbledon. I knew I was going to have to play my way into shape, and I think I've done that pretty well." Keys, 22, underwent wrist surgery last November but continued to feel pain after coming back in March, and required another operation after the French Open in June. "It's been a big weight off of my shoulders and I'm playing really free," said Keys. "More than anything, I'm just really, really enjoying my time on the court. I think that's been a massive part of why I have been playing well." The pair know each other well but have met just once professionally, with Stephens winning in two sets in Miami two years ago. That did nothing to damage their off-court relationship. "She's probably one of my closest friends on tour," Stephens said of Keys. "Love her to death. It's obviously going to be tough. It's not easy playing a friend." Both powerful, Keys is the more attacking player, which can often lead to as many errors as winners, but in her semi-final against Coco Vandeweghe she had the balance absolutely right. "Everything kind of just worked for me, and if I wanted to go in a certain spot, that's where I went, and it seemed like it worked," said Keys. "Playing Sloane, I know she's going to get a lot of balls back, and she's going to reset the point over and over again. "I'm just going to have to be patient, not go for too much too soon and just try to keep building points until I finally have the right ball." Despite the foot surgery, Stephens showed in her win over Williams that her athletic defensive skills remain a major part of her game. "I've got a lot of matches in. I've run a lot. I've played a couple of three-setters," she said. "So, yeah, I think my movement is probably what's kind of kept me in some of these matches, shockingly." Six-time US open champion Serena Williams used her first social media messages since becoming a mother a week ago to congratulate Keys and Stephens on reaching the final. "There are NO words to describe how proud and how happy I am for @Madison-Keys keys and @SloaneStephens for making the US open finals," Williams tweeted.